All of the news following competitive Crokinole. The scariest thing about Andrew Hutchinson’s game is that even with expectations (and hence pressure) rising, the man is continuing to perform. The Waterloo County Classic Crokinole tournament can be a grind that really tests one’s ability to maintain a high level of play, but for Hutchinson the task seemed to be all too reasonable, as he put forth a solid dominating performance that spearheaded the Waterloo Crokinole Club’s second straight team victory. The 2019 event saw 3 new teams: Teeswater, Niagara, and the scintillatingly-named “King Street Quartet” that was the moniker for the 4 individuals who are active participants in two different crokinole clubs located on King Street in the Waterloo region. Also in action was team Golden Horseshoe, making their second appearance at the event, team Waterloo making their 10th appearance, and the combined team of London/Scone (London made their debut in 2008, and Scone followed in 2015). Lastly, the St. Jacobs crokinole club rounded out the field, appearing for the 27th straight year, and now becoming the only club to have perfect attendance at the event. That honour used to be shared with the Preston and Varna clubs, whose inaction this year has broken that streak. However, the Preston Club continues to the honoured in the annals of crokinole history, most likely thanks to Wayne Kelly’s best selling crokinole book that, among other things, detailed the club’s long history. The Preston club’s rule set from 1942, as well as a picture of the club from 1953, is displayed prominently at the Schneider Haus museum next to the world’s oldest crokinole board. Getting down to the crokinole action, the expected battle for team supremacy was between Waterloo, attempting to defend their title first earned last year, and St. Jacobs, looking to get back on top for the first time since 2015. At the halfway point (12 games) the Waterloo-St. Jacobs battle was clearly coming to fruition. Andrew Hutchinson and Roy Campbell led their respective teams with identical scores of 70 points, with Reid and Jeremy Tracey also trading off identical scores sitting tied for 3rd. Waterloo carried a slim 7 point margin into the lunch break, most of which was spent enjoying the kind offerings of the Schneider Haus staff. But the lunch break also featured some serious discussions among teammates about their afternoon matchups, and some semi-serious trash-talk to their various opponents (of course it was all in good fun). The battle for the individual title began to tilt towards Hutchinson in afternoon, especially after Dwayne Campbell scored an 8-0 drubbing over Roy Campbell (namesakes, but no relation) in game 14 of 24. That was until the 16th game that saw Hutchinson and Roy Campbell finally meet, where Campbell closed the gap almost entirely with a 7-1 victory. Following the game, Hutchinson still led with 91 points, but Campbell was right behind at 90, with 8 games to play. Dramatically and spectacularly, Hutchinson was unperturbed by the loss, and rattled off the next 18 rounds in a row without dropping a point. He ended the day with 57 out of a possible 64 points in his final 8 games, reclaiming an adequate advantage over Campbell for the individual title. Shifting slightly lower down the rankings table, for the purposes of excitement, it would be fun to say that the afternoon saw some players falter, and others charge to the finish. However, that was not the case, and in an impressive show of consistency, the rankings from the halfway point remained the exact same at the end of the day. Status quo was exactly what the Waterloo team was hoping for, and the final results show that they were able to ultimately extend their advantage over St. Jacobs to 20 points, and successfully defend their Schneider Haus title. Interestingly the St. Jacobs club did triumph over Waterloo in their head-to-head matches, taking a 67-61 point edge. It was a fine showing from the Niagara club, who debuted at the event and took the 4th place spot. The 3rd place finish was the highest ever for team Scone, and also a pretty respectable finish for London, considering London’s 2nd place finish last year featured a team of Justin Slater and Ray Beierling. 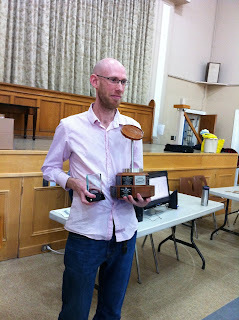 The individual victory gives Hutchinson his 3rd straight crokinole title in what has been a break-through season for the converted cues player. This string of events from Hutchinson does draw some similarities to that of Nathan Walsh, who scored a break-through season in 2013-2014 in a similar fashion (first NCA singles title in the Fall, a 2nd NCA victory in London, followed by a maiden Schneider Haus victory in April). Coming up next for most players around these parts is the Ontario Singles Championship in St. Jacobs. However for Hutchinson, he’ll squeeze in a showing at the US Open Doubles event in Voorheesville, NY, partnering with Jeremy Tracey, where they will also be competing against the current Ontario and World Champion Beierling brothers, along with local American contingent. One of the best feelings in competitive crokinole is having Jon Conrad exclaim “nice shot” after you’ve just drilled an unexpected 20. Dwayne Campbell knows that feeling well. Dale Henry said he had lacrosse on his mind throughout the day, but clearly all he’s thinking about here is the 56.7 degree angle at which he needs to strike the near-most left peg to have the maximum possible percentage chance of generating a 20. Bob Jones doesn’t want Andrew Hutchinson to get a ricochet 20. Andrew Hutchinson does not abide. Hutchinson makes a ricochet 20 on purpose, then claims this ricochet-peg 20 wasn’t intentional. Final shots of the round, tied in 20s, future doubles partners show each other how good they are. Double with a follow-through 20. That was smooth. Roy Campbell out here willing takeout 20s into existence in a way that science can’t explain. The only problem with this highlight is that a shot of this quality really deserves a fist pump. The only problem with this highlight is that a shot of this quality really deserves a MUCH LARGER fist pump. Walsh sneaks out a tie round against his doubles partner with a 2-peg rebound on the final shot. When you are really curious about how the scores are going to end up. There was no doubt about the strength of Andrew Hutchinson’s game, returning to the London event for his first crokinole tournament after winning his first NCA title in November. He was tested in the morning with a very difficult draw, to which he qualified out of with ease, then proceeded to dominate his afternoon matches until facing a nearly flawless Robert Bonnett in the finals. But he proceeded unflinchingly, even overcoming a deficit in the very final round to win the 2019 Forest City Flickers final by a score of 10-8. 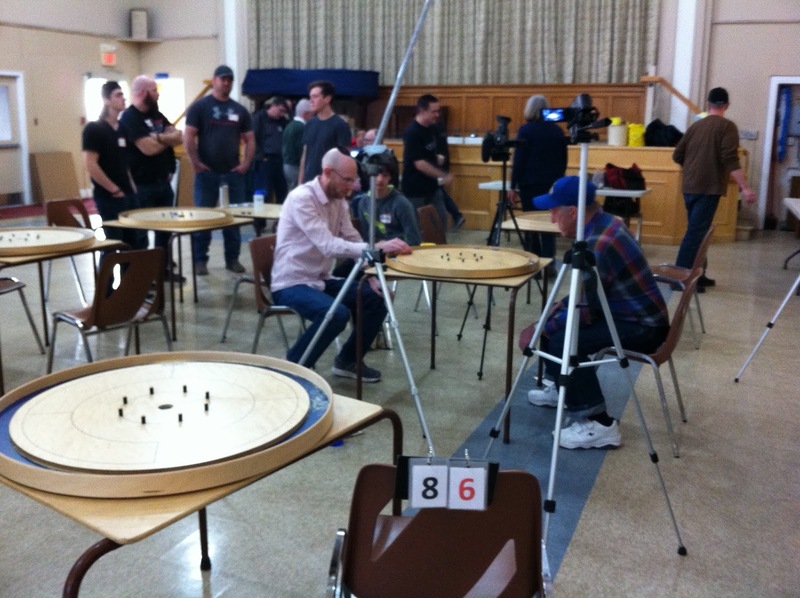 52 flickers entered the Saint James Westminster Church in London for the 11th edition of the crokinole event, dating back to 2009, with 31 on the competitive side and 21 in the recreational. In the morning groups, Jo-Ann Carter led the Recreational A pool with 50 points and 52 20s in 8 games. Mark Gallas was behind in second with 48 points, and followed by Mark Geris, Janet Diebel and Dallas Fewster. Ron Langill led the Recreational B pool in the morning with 54 points and 58 20s in 9 games, followed closely by Rich Vanden Hoven at 52 points, and then by Bill Geris, Cor Vanden Hoven and Doreen Sulkye making the afternoon A group on the Recreational side. The competitive pools were split into 3 in the morning, and Connor Reinman, who was playing in his first NCA event since October and said to be ramping up his preparation for the World Championships, led the A pool by a decent margin with 55 points and 89 20s in 9 games. Ray Beierling scored 49 points and Nolan Tracey scored 43 to make the afternoon A group, edging out Bev Vaillancourt who had 40 points. The competitive B pool seemed to be by far the most challenging group, featuring 4 of the top 7 in the current NCA standings, along with a few more strong NCA non-regulars. Nathan Walsh had a terrific morning with what averaged to 58.5 points and 86.6 20s over 9 games, followed by Andrew Hutchinson at 48 points and Jason Beierling at 45. Jeremy Tracey and Rex Johnston fell victim to the strong group and had to settle for the B group with 42 and 41.6 points respectively. In the C pool, Jon Conrad was true to form, leading the way in points despite a lower 20 count, with 51 points and 63 20s. Roy Campbell and Robert Bonnett rounded out the top 3 with 46 and 45 points, while Reid Tracey scored 43 points, which was enough to grab the sole wildcard spot in the A group for the afternoon. This was just two points higher than Robbie Thuot at 41 points, who was looking to make the A group for the second event in a row. The afternoon Recreational B Group was led by Lola Vanderheide who scored 45 points in 9 games, and was joined in the playoffs by Maxine Whitmore, Al Hoftyzer and Pat Weiler. However in the playoffs it was Pat Weiler who overcame the 4th seed to win the group. In the A Group, Ron Langill was top of the table again, with 51 points in 9 games. Cor Vanden Hoven scored 46 to finish second, with Jo-Ann Carter right behind at 44. Bill Geris scored 42 points to finish 4th and get the final playoff spot, just ahead of Mark Geris at 41 points. The “first to 9 points” semifinals were very tight with both being decided by scores of 10-8 as Carter defeated Vanden Hoven and Langill defeated Geris. In the finals Ron Langill completed a day in which he led from the morning to the very finish, winning the final 10-4 over Jo-Ann Carter. In the competitive C Group, Tom Johnston had the top score with 50 points in 9 games. Peter Carter and Howard Martin both scored 45 points to finish 2nd and 3rd and setup their playoff semifinal, while Josh Davis scored 41 points and held the head-to-head tiebreaker over MJ Andreola for the final playoff spot. Johnston and Carter advanced to the finals, following their semifinal victories, where Tom Johnston won the match to take the C title. In the B Group, Fred Slater looked quite strong, scoring 46 points in 9 games for the top seed, just ahead of Christina Campbell who racked up 44 points. Jeremy Tracey scored 42 points and earned the high 20 score in the group with 75. Bev Vaillancourt earned the final playoff spot with 39 points, just two ahead of Rex Johnston and Andrew Korchok. Slater scored a 9-5 semifinal victory over Vaillancourt, while Tracey found momentum late to win over Campbell 10-8, which he carried through into the final match, defeating Slater 10-2. There was an oddity in the competitive A Group with all three pool leaders from the morning missing the cut for the final 4. Instead it was Andrew Hutchinson making his 5th straight top 4 with 52 points in 9 games for the top seed, and hometown Ray Beierling finding the 2nd seed with 47 points. Robert Bonnett followed up his 3rd place in Owen Sound with 41 points to make the final four again, while Reid Tracey, for the third-straight tournament, earned the 4th seed and advanced to the playoffs (although this time it wasn’t by virtue of a tiebreaker). Roy Campbell finished on the bubble in 5th place with 36 points. The semifinal, and also what would be the finals, matchups were all first-time meetings in elimination games, although it was an identical final 4 to that of the 2018 Owen Sound event. The Hutchinson/Tracey matchup was notable for Hutchinson electing for defensive strategies on two occasions as he chose to hide discs rather than push for 20s, which ultimately ended up being profitable in a 9-3 victory. The Bonnett/Beierling match would also be a 9-3 victory for Bonnett who capitalized when given a few different chances to score some crucial follow-through 20s. In the 3rd-place game, Reid Tracey took a spirited affair by a score of 10-8 over Ray Beierling, to earn 3rd place and his highest ever finish at an NCA event. So all that was left was the finals between Robert Bonnett and Andrew Hutchinson. For Bonnett, it was his second NCA final (the first being the 2017 World Championships), and for Hutchinson it was his fourth NCA final, with both men seeking their second crokinole title. Hutchinson led 6-2 and had threatened to take an even more commanding lead in the 6th round when he led in the 20 count but faced 3 opposing discs. He lined up a triple takeout on his final shot that was ultimately unsuccessful, allowing Bonnett to tie the match 6-6. Both responded well in their respective hammer rounds, capitalizing on first shot misses from their opponents to send the match to 8-8 with it all coming down to one round for the title. In the final round, advantages swung to Bonnett as Hutchinson was the first to miss. However, in Bonnett’s attempt to add to his 20 count, he left a hanger 20, which Hutchinson converted to level the round. After Bonnett missed the open 20 on his 7th shot, Hutchinson stuck his disc perfectly in front of a peg, leaving Bonnett no chance for a takeout-20, clinching the 10-8 thriller victory for Hutchinson as he won the 2019 London title. It’s worth noting that Hutchinson’s remarkable string of strong results this season has been near perfect, and has only seen him lose on a couple occasions to Ray Beierling and Justin Slater. *There’s a significant asterisk considering that the NCA Tour has had numerous different point structures over the years. Additionally, while other titles weren’t completely clinched before the Tour finale, some years only a very specific scenario could have unfolded to result in the leader being surpassed in the final tournament. 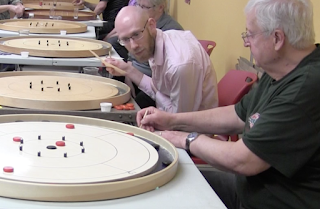 The next NCA event on the calendar is the 2019 Ontario Singles Crokinole Championship on May 4th in St. Jacobs, but before that, the 27th edition of the invitational team Waterloo County Crokinole tournament will take place at the Schneider Haus museum in Kitchener on April 13th. CrokinoleCentre was created to capture the competitive crokinole scene. 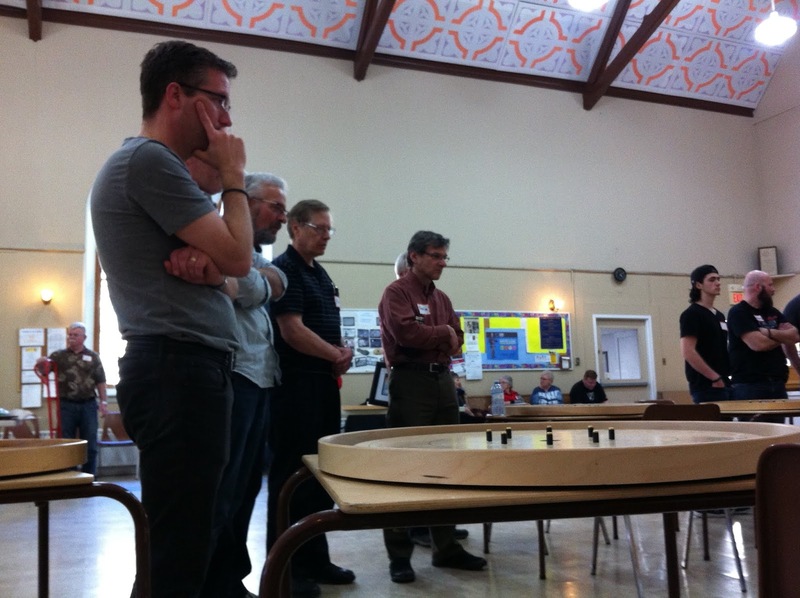 It is hoped that Crokinole Centre will help stimulate interest in the competitive side of crokinole, and bring the game to the next level. If you have a crokinole story, club, or tournament to share, let CrokinoleCentre know.